Soapstone countertops are a unique and natural alternative to other common kitchen countertop surfaces. Soapstone countertops are akin to cement countertops, in the sense that they don’t always come to the top of one’s mind when thinking about installing new kitchen countertops. 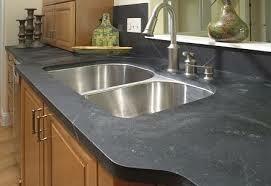 This said, soapstone countertops offer a number of benefits compared to other kitchen countertop surfaces. For example, soapstone countertops have a very distinctive warm, smooth, and silky feel. Also they are extremely durable, resistance to heat, non-porous, and are impervious to acidic solutions such as lemons and limes etching into them. Thus they hold up to the heaviest of used kitchens and cannot be scorched or stained. The only real knock with soapstone countertops is that soapstone is very soft and thus scratches easily. But this said, often homeowners like the old world charm of soapstone and actually enjoy seeing the worn patina look. Also, due to the fact that soapstone is so soft, scratches can easily be sanded out with a little sandpaper and mineral oil. Soapstone is very heavy and dense. It comes from siliceous natural stone that is mainly comprised of chlorite and talc. The talc is what gives soapstone it’s beautifully soft and smooth surface. The talc is also what gives soapstone its high softness and susceptibility to scratching. When most people think of soapstone countertops they think of old classroom laboratories with dull black grade countertop surfaces. Though it is true that classroom laboratories have always had an affinity to soapstone countertops due to their durability, soapstone is actually available in a variety of colors. Soapstone ranges in color from jet black, to bluish gray, to a light ash gray. In addition light veins of colors are also commonly seen running through soapstone countertop surfaces. Soapstone countertop surfaces can also be purchased with a variety of finishes, including a high gloss finish, a honed or matte finish, or an aged patina finish. So if you’re in the market for installing new kitchen countertops make sure to also check out soapstone countertops when sifting through the granite, Silestone, and Corian color palettes. You might just find that Soapstone maybe the perfect choice for your kitchen remodeling plans.